Chicago, IL - Holy Resurrection Serbian Orthodox Cathedral in Chicago will liturgically celebrate the 9th Centennial of the birth of Stefan Nemanjic (St. Simeon the Myrrh-flowing) and 2nd Centennial of the birth of Njegos on Sunday, December 8th, 2013, with a hierarchical Divine Liturgy and banquet featuring special guest hierarchs, His Eminence Metropolitan Amfilohije of Montenegro and the Littoral, and His Grace Bishop Maxim of Western America, as well as diocesan host hierarch, His Grace Bishop Longin of New Gracanica and Midwestern America. The liturgical celebration of these two historical milestones will begin with Matins at 8:30 AM, followed by the Hierarchical Liturgy at 9:30 AM. 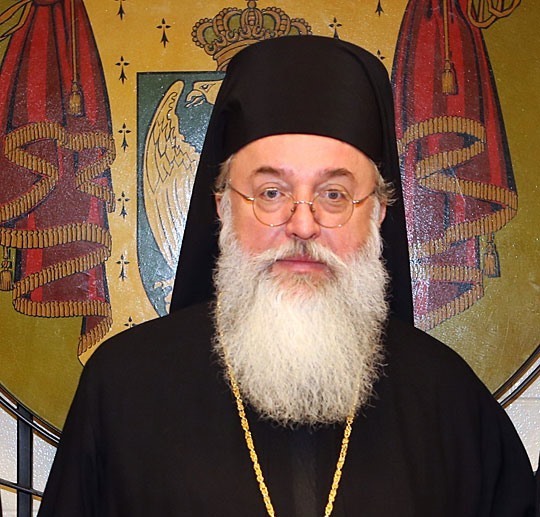 "A visit by Metropolitan Amfilohije is always an important event for our Church on this continent because, apart from Patriarch Pavle, no one else from our Fatherland worked so tirelessly for the unity of our Church and people, and his contribution to overcoming the unfortunate schism is immeasurable," said His Grace Bishop Longin about the Metropolitan's upcoming trip to the U.S.
"We are therefore thankful for his blessing and his visit to our area," he added. "This year our Church celebrated several jubilees, and the celebration of the Milan Edict, which is undoubtedly an important anniversary for all of Christendom, seems to have somehow overshadowed the 9th Centennial of the birth of Stefan Nemanja, later St. Simeon the Myrrh-flowing. In any event, this centennial was not adequately addressed and celebrated though the role and significance of the founder of the Nemanjic dynasty is almost impossible to adequately describe," the bishop continued. "The other great leader from our people, Metropolitan Petar II Petrovic or Vladika Rade, as none other accepted, understood and turned into prose the most important heritage of the Nemanjic dynasty -- that is the Orthodox Christian faith and its ideas of sacrifice, freedom and refusal to surrender," the bishop said, emphasizing the connection between Stefan Nemanja and Njegos whose centennials will be celebrated together at the December 8th event. "We consider Metropolitan Amfilohije to be today not only a successor on Njegos' glorious throne, but also one of the best connoisseurs and interpreters of his thoughts and deeds, and we rejoice in celebrating the Liturgy with him and seeing him at Holy Resurrection Cathedral this December 8th," Bishop Longin added. Following the Hierarchical Divine Liturgy, a banquet will be held in the Cathedral hall featuring an address by Metropolitan Amfilohije on the Nemanjic-Njegos centennials. For more information about this event, please contact the Church office at 773-693-3366.